When Mackenzie Merrill first picked up the French horn in fifth grade, she didn't know that she was opening herself up to a world of music that would lead her to Europe playing with an international symphony. Merrill, a 1999 PAHS graduate, is a member of the Philharmonia of the Nations, an orchestra made up of young musicians from 40 countries and five continents. The group was organized by a German conductor as a symbol of peace. Since January, Merrill has played with the orchestra in Germany, England, and Ireland. Last week, joined the orchestra again for a short tour of Germany and Italy. Mackenzie Merrill plays the French horn with the Philharmonia of the Nations, an international orchestra. Since joining the orchestra in January, Merrill has performed in England, Germany, Ireland, and Italy. Since joining the Philharmonia of the Nations, Merrill's life has been a whirlwind of hotel rooms, bus rides, long rehearsals, and frequent performances, she said. During her first tour of Germany, the group played 20 concerts in 21 days. Merrill's second tour of England and Ireland was shorter at two-and-a-half weeks but still hectic, she said. Still, she's glad she didn't miss the opportunity. "I've learned so much," said Merrill of her experiences with the orchestra. All of the musicians she plays with are very good, and some are professional musicians, said Merrill. Though it can be intimidating at times, she has used the opportunity to improve her skills and to learn about other cultures. One of the highlights of playing with the group has been playing in some magnificent halls, said Merrill. Some of her favorites were the Berlin Philharmonic Hall, the London Royal Festival Hall, and the Birmingham Symphony Hall, which she describes as the "most amazing" hall. "It's huge and gorgeous and holds 2,500 people," exclaimed Merrill. The concert in England was nearly sold out, making it the largest crowd for which she has ever performed. With so many countries represented in the orchestra, Merrill was pleased to find out that many members spoke English. She was also relieved to learn that the conductor used both English and German when directing the orchestra. People who speak the same language tend to stick together, though, so most of her closest friends from the group are from other English-speaking countries. Merrill encountered a few surprises during the tour. She was expecting the musicians to be very young - mostly in their 20s like her - and amateurs. Once reporting to Germany, however, she found that the musicians spanned from their 20s to their late 40s in age and that some were professionals. The pace that she had to keep while touring was also a surprise to Merrill. Before joining the tour, she would spend weeks packing and preparing for a trip. Now, she can be packed and ready for an international tour in an hour, she laughed. Merrill also found that personal time was minimal and there was very little time to explore the cities where the group played. Merrill did, however, find time during the tour to visit London, and she stayed behind after the tour to visit Vienna. Merrill was invited to join the Philharmonia of the Nations after auditioning at the San Francisco Conservatory of Music - where she is a graduate student - last fall. Though she was accepted then, she had no indication when she would be asked to play. In January, just three weeks before the tour was to start, Merrill got an invitation to join the group in Germany. When she arrived in Germany, Merrill - just one of two U.S. musicians on the tour - was surprised to find out that there would be just days of rehearsals before the group played together at its first venue. Fortunately, the musicians were so good at their craft that very little time was needed to get the musicians working well together, said Merrill. Like most kids, Merrill was introduced to the French horn when she joined the band in fifth grade at PAES. While she liked the horn, she didn't think much about playing professionally until she auditioned for the Minnesota All State Orchestra as a high school junior and was accepted. 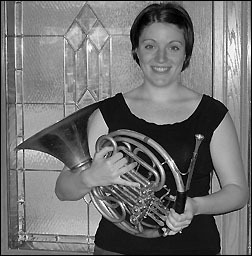 During her senior year, Merrill played in the Minnesota Youth Symphony before attending DePaul University in Chicago, where she graduated in 2003 with a degree in French horn performance. After she finishes the short tour of Germany, Merrill plans to return to San Francisco to finish graduate school. She won't be joining the group for future tours because now she needs to concentrate on school, auditions, and planning her wedding in May 2005. Merrill hopes to find a job playing with a symphony in the United States, but she knows it will be difficult. "Classical music is dying," said Merrill, noting that jobs are scarce. She doesn't want to do anything else, though. She wants to do her part to keep classical music alive.